More often than not at the Adelaide Fringe it’s the unknown shows you take a chance on that end up some of your favourites. This is what happened when I saw Jason Chong (Nova, The Project) and Chris Weber (Hilltop Hoods, The Transatlantics) in Blowhards. 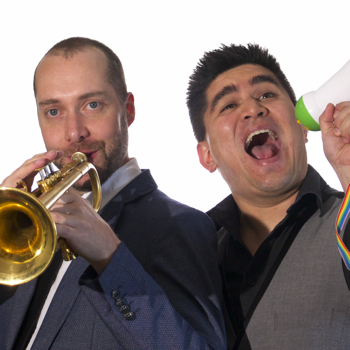 A comedian and a muso, together they charm audiences with their unique brand of musical comedy. This show combined my three favourite things; parody songs, audience participation, and heart. And with an audience filled with what seemed to mostly be the artists’ family and friends, it had plenty of heart. Between their lively banter, Chong’s mother’s numerous interruptions and his constant references to his “Door-wife”, the show felt like a family function, but with better jokes and people who actually liked each other. The duo played an impressive set list which covered a range of topics springing from his anecdotes, with a heart-felt ballad to his wife (and modern dating trends) and a Kasey Chambers cover lamenting the problems of being half-Asian, as some of my favourites. It’s not easy to pull off a comedy routine through music, but Chong and Weber made it look so effortless I could’ve listened to them for hours. Throughout the performance they would interlude with a few opening bars of a Lionel Richie classic in various languages as part of “Hello Bingo”. With the top prize a set of tickets to see the Fringe show of another local act, it was great to see such a cross-promotional gesture for up-and-coming talent. After taking a backseat for much of the performance, Chris Weber stood up and performed somewhat of a musical experiment worthy of Reggie Watts, which really demonstrated his skills (if expertly switching between trumpet and trombone all night wasn’t impressive enough). The only downside to the performance would have to be venue. While the Elephant British Pub is an excellent location, it was a busy Friday night and there wasn’t a way to block out the rumble from patrons downstairs. This proved distracting in the beginning, but I was able to ignore it for the most part as the show got going. In all, Blowhards is a simply excellent show. It’s funny and clever and arguably one of the best acts I’ve seen this Adelaide Fringe. If you’re looking for a good, enjoyable night out with easy bar access, definitely check them out.